WARD, EDMUND, printer, newspaperman, author, office holder, and publisher’s agent; b. 24 June 1787 in Halifax, son of Edmund Ward and Hannah Rogers; m. there 9 Nov. 1817 Eleanor Bowers Jackson, and they had five sons and two daughters; d. 31 Oct. 1853 in Hamilton, Bermuda. Edmund Ward’s father, a loyalist from Connecticut, met his wife while he was a prisoner in her father’s home during the American Revolutionary War; Captain Ward later served as an official in the barracks department in Nova Scotia, where he received land grants after the war. Young Edmund was trained as a printer in the office of William Minns*. In 1809 the governor of Bermuda, Brigadier-General John Hodgson, invited him there to edit a newspaper, which became the Royal Gazette. In Bermuda, Ward also issued the Gleaner, a short-lived literary paper, and the Weekly Gazette; he held a clerkship in the Court of King’s Bench and a post in the customs department; and he helped organize a Sunday school. 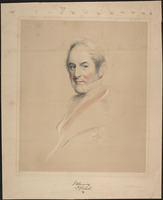 Because he was an associate of the unpopular Hodgson, he became involved in local controversies; the House of Assembly sometimes withheld payment for printing, and in 1815 declined to give him its printing contract. Ward’s Bermuda career ended over the incident of the capture of the American warship President by the frigate Endymion and other ships of a blockading British squadron off Long Island on 14–15 Jan. 1815. When the President was brought to Bermuda, Ward reported that the Endymion alone had captured her (which was denied in the official American reports) and that 68 American seamen were discovered stowed away in an unsuccessful ruse to recapture the ship. Governor Sir James Cockburn ordered Ward to retract the latter statement, but Ward trusted the word of a British lieutenant and stuck to his story; he was beaten up by an American midshipman and lost his commission as king’s printer on 12 April. He angrily issued a pamphlet on the whole affair, continued the Weekly Gazette for a short time, and then returned to Halifax. In April 1816 Ward began the Free Press, a tory newspaper that reported the House of Assembly debates and took a lively interest in economic and cultural affairs. But his stubbornness and quick temper, as well as his need to increase circulation, soon gained the paper a reputation for political quarrelling and personal abuse. His chief antagonists were publisher Anthony Henry Holland* and the contributors to his liberal newspaper the Acadian Recorder. The enmity reached a climax in 1820, when Ward was horsewhipped by George Renny Young, the son of Recorder contributor John Young*; the next year Ward was beaten up by Holland’s brother Philip John. In court in the latter year Ward was fined £2 for libelling another Recorder contributor, James Irving, while Philip Holland was fined £9 0s. 3d. for his attack on Ward. In 1838 the Hollands’ successors, John English and Hugh William Blackadar*, were to print a letter in the Recorder from one A. H. Duncan, who evidently had crossed swords with Ward in Fredericton, which stated that Ward was “celebrated for many a feat of thoroughbred swindling.” Duncan then disappeared but English and Blackadar were fined £40 for libel in June 1840. Ward’s other publications included the Nova-Scotia almanack, The farmer’s almanack, Ward’s almanack, and one issue of the British North American Magazine, and Colonial Journal. Elected secretary of the Halifax Temperance Society in 1834, that May he began the Temperance Recorder to bring together the 10,000 persons in some 90 temperance societies around the province whom he hoped to attract with a low subscription rate. He always had trouble collecting subscriptions, and by 1837 was feeling the competition of the new Baptist paper, the Christian Messenger. His premises were offered for sale in May and auctioned in late October, by which time the Temperance Recorder had ceased to appear. For several years Ward had travelled extensively around the Maritime provinces lecturing on temperance, and after one such trip to New Brunswick in 1837 he began the Sentinel and New Brunswick General Advertiser on 16 December in Fredericton. Ward was appointed assistant emigrant agent for New Brunswick in 1840 through his friendship with the lieutenant governor, Sir John Harvey, to whom he gratefully dedicated a pamphlet advocating the cultivation of the interior, An account of the River St John, with its tributary rivers and lakes. Ward is also reputed to have been the author of Solitude and other poems; by an old resident of New Brunswick, which was printed at his office. When the Sentinel closed down some time early in 1844, Ward moved to Halifax to issue a short-lived tri-weekly, the Evening Gazette, but soon left for New York to work as a reprint publisher’s agent, in which role he travelled extensively through the southern states. In June 1846 he was back in the Maritimes as the agent for the New York Anglo-American newspaper, and by late 1848 he was the agent for the New York firm of Leonard Scott and Company, which had just secured the American reprint rights for the major British magazines. Since Nova Scotia now allowed these reprints in legally, Ward pressed for reduced postal rates so that subscribers outside Halifax could get the periodicals at Halifax rates. Ward had lost the Scott agency by early 1850, at a time when he was burdened by the deaths of three sons. Forced to work as a manual labourer, he sought relief for his desperate condition from Harvey, now the lieutenant governor of Nova Scotia. Little is known about the years Ward then spent in New York City before he went to Hamilton, Bermuda, in October 1853 to assist his son Robert, the editor of the Bermuda Herald, who had contracted yellow fever. Ward himself came down with the fever and died suddenly. He was buried in the parish of Pembroke. Although quarrelsome and vindictive in public, Ward was remembered with affection by his children. A good parliamentary reporter and an advocate of temperance and other social improvements, he was a journalist with a direct, simple style. Edmund Ward is the author of Report of a debate on the quit rent, which took place in the House of Assembly, in the province of Nova Scotia . . . (Halifax, 1830) and An account of the River St John, with its tributary rivers and lakes (Fredericton, 1841). His account of his Bermuda career, apparently written in the 1840s, was published under the title “Seven years residence in Bermuda,” in the Bermuda Hist. Quarterly (Hamilton), 5 (1948): 183–98; 6 (1949): 34–49. A typed note inserted opposite p.238 of a copy of Robert James Long’s Nova Scotia authors and their work, a bibliography of the province (East Orange, N.J., 1918) held by the Acadia Univ. Library (Wolfville, N.S.) attributes the authorship of Solitude and other poems; by an old resident of New Brunswick (Fredericton, 1842) to Ward. The addendum is probably Long’s own, but it may not be accurate and no other supporting evidence is available. PAC, MG 23, D1, ser.1, 61, book 3, Robert Ward to J. W. Lawrence, 24 Sept. 1880; MG 24, B1, 3: 255a–c; 176: 6002–5. PANS, MG 100, 243, nos.35–36; RG 1, 120: 239; 227, no.113; 258, no.93; RG 5, GP, 9, petitions of Edmund Ward, 17 Nov. 1818, 19 Aug. 1820, 10 April 1821, 3 May 1822; RG 7, 19, Ward to Howe, 17 Oct. 1848; RG 20A, Ward, Edmund, 1804, 1805; RG 24, 2: 207. William James, A full and correct account of the chief naval occurrences of the late war between Great Britain and the United States of America . . . (London, 1817), 449–51; An inquiry into the merits of the principal naval actions, between Great-Britain and the United States . . . (Halifax, 1816), 90–91. N.S., House of Assembly, Journal and proc., 1832, app.16. Acadian Recorder, 27 Oct. 1821; 10 Nov. 1838; 2, 9 May 1840; 3 Feb. 1849. Daily Sun (Halifax), 31 [sic] Nov. 1853. Free Press (Halifax), 20 Oct. 1818; 19 June, 30 Oct. 1821. New-Brunswick Courier, 9 April 1831, 27 June 1846, 19 Nov. 1853. New Brunswick Reporter and Fredericton Advertiser, 18 Nov. 1853. Novascotian, 23 April 1834; 10 Sept. 1835; 1 Oct. 1840; 6 May, 23 June, 8 July 1844; 19 Feb., 5, 19 March, 24 Dec. 1849; 25 Feb. 1850; 14 Nov. 1853. Times (Halifax), 24 March 1846. J. R. Harper, Historical directory of New Brunswick newspapers and periodicals (Fredericton, 1961), no.96. An historical directory of Nova Scotia newspapers and journals before confederation, comp. T. B. Vincent (Kingston, Ont., 1977), nos.26, 46, 50, 126. W. G. MacFarlane, New Brunswick bibliography: the books and writers of the province (Saint John, N.B., 1895), 82. Morgan, Bibliotheca Canadensis, 387. G. E. N. Tratt, A survey and listing of Nova Scotia newspapers, 1752–1957, with particular reference to the period before 1867 (Halifax, 1979), nos.144, 192, 200, 342, 344. Duncan Campbell, Nova Scotia, in its historical, mercantile and industrial relations (Montreal, 1873), 297. V. L. O. Chittick, Thomas Chandler Haliburton: a study in provincial toryism (New York, 1924), 69. W. H. Kesterton, A history of journalism in Canada (Toronto, 1967), 17. Beamish Murdoch, A history of Nova-Scotia, or Acadie (3v., Halifax, 1865–67), 3: 450. William Smith, The history of the Post Office in British North America, 1639–1870 (Cambridge, Eng., 1920), 186–87. H. C. Wilkinson, Bermuda from sail to steam; the history of the island from 1784 to 1901 (2v., London, 1973), 1: 233–34, 273, 350–53; 2: 680, 834–35. M. L. Chase, “Edmund Ward and the Temperance,” N.S. Hist. Quarterly (Halifax), 5 (1975), special supp. : 19–36. D. C. Harvey, “The intellectual awakening of Nova Scotia,” Dalhousie Rev. (Halifax), 13 (1932–33): 18; “Newspapers of Nova Scotia, 1840–1867,” CHR, 26 (1945): 294. J. S. Martell, “The press of the Maritime provinces in the 1830’s,” CHR, 19 (1938): 35–36, 38–39. George L. Parker, “WARD, EDMUND,” in Dictionary of Canadian Biography, vol. 8, University of Toronto/Université Laval, 2003–, accessed April 26, 2019, http://www.biographi.ca/en/bio/ward_edmund_8E.html.